"Tundra wolf" is one of many names for the gray wolf, the largest of all canid species. Gray wolves are also known as Arctic wolves, common wolves or timber wolves. Their size and color varies depending on their geographic location. Arctic wolves are pure white, while others are a varying mix of black, gray and brown fur. Gray wolves weigh between 50 and 175 pounds with bodies between 3 and 5 feet in length. The gray wolf historically lived all over most of the northern hemisphere, as far north as the Arctic Circle and as far south as Central America, central Asia and northern Africa. Due to habitat destruction, human predation and habitat destruction, wolves have a much smaller geographic range in the 21st century. Modern gray wolves are found only in North America and Eurasia. 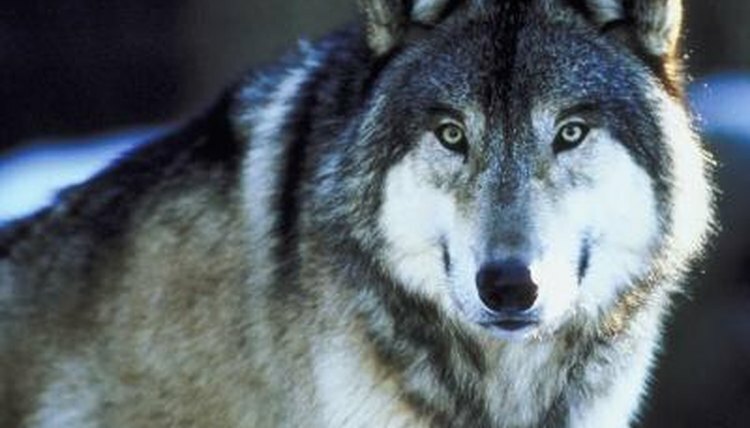 Seven Eurasian and five North American subspecies of gray wolf are officially recognized. Gray wolves are wide ranging and adaptive. Although they stay away from areas heavily cultivated or populated with humans, they can be found in mountains, forests, the Arctic tundra, prairies and deserts. These highly territorial wolves maintain a home range of anywhere between 130 and 8,000 square miles, and viciously defend it against intruders. The size of a wolf pack’s home range depends on the amount and density of prey in a given location. Wolf packs may include up to 36 members, depending on the availability of prey in the area, but tundra wolf packs typically consist of between five and nine individuals: a single alpha pair and their offspring. Gray wolves have a strong dominance hierarchy, and the alpha male and female are the only breeding members of a pack. They are monogamous and mate for life. If one of the alphas dies, another will rise to take his or her place. Tundra wolves are highly intelligent and social, and use cooperative hunting techniques within their packs to succeed in killing prey up to 10 times the size of an individual wolf. They are strictly carnivores, but their diet depends on their geographic range and the availability of various prey animals. Wolf packs are usually stationary during the spring and summer while they rear their pups. In the fall and winter they are nomadic and move at night, sometimes covering distances of more than 100 miles.